Cycling in Thailand is a popular activity as in many other countries. Getting around Bangkok by bicycle can be a hair-raising experience with the city’s constant traffic. 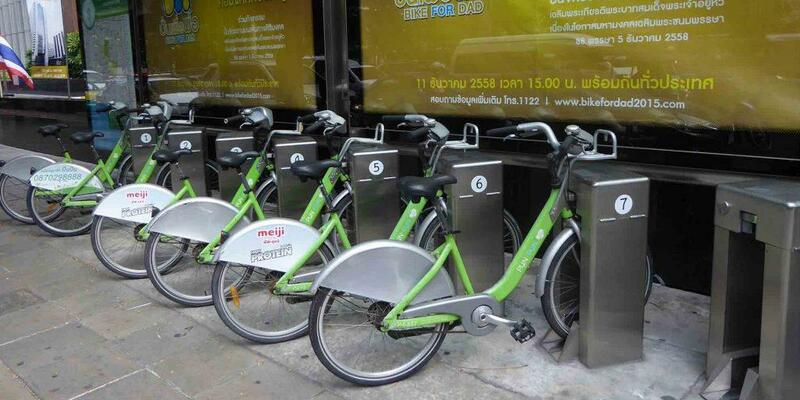 However, Bangkok is making a big effort to be a bicycle-friendly city with a London style Boris bike sharing scheme. Its called Pun Pun bike share with 50 bike stations in the inner city. There is even a website of the same name but sadly only in the Thai language. This makes it useless for English-speaking visitors to Bangkok as you need to register to use the service. The staffed bike stations seemed to have disappeared so you may have to go to the Tourist Information office on Phra Athit road to register. You will need to show your passport. Once registered you can buy a Pun Pun smart card. The fee is 320 baht and includes 100-baht credit and insurance. You will need to have your own helmet and bicycle lock. Stations have free bicycle pumps. You cannot keep a bike overnight. There is a late return fine. Bikes are free for 15 minutes, 10 baht for 15-60 minutes, 20 baht for 1-3 hours, 40 baht for 3-5 hours, 60 baht for 5-7 hours and 100 baht for 8 hours or over. Once you have your card you can pick up/return a bike from/to any station. You simply tap your card on a screen at the bike station and enter a 4-digit code, choose the bike you want and tap your card again to unlock it. You will receive a map of all the bike station locations when buying your card. Bangkok has a growing number of bicycle lanes but sadly you will find many of them underused and blocked by parked cars, food vendors, and motorbikes. Be careful when cycling in Bangkok as many Thai motorists don’t show much consideration for cyclists. Rattanakosin old city neighborhood has an 8 KM cycling route that runs in a loop passing the area’s top sites. 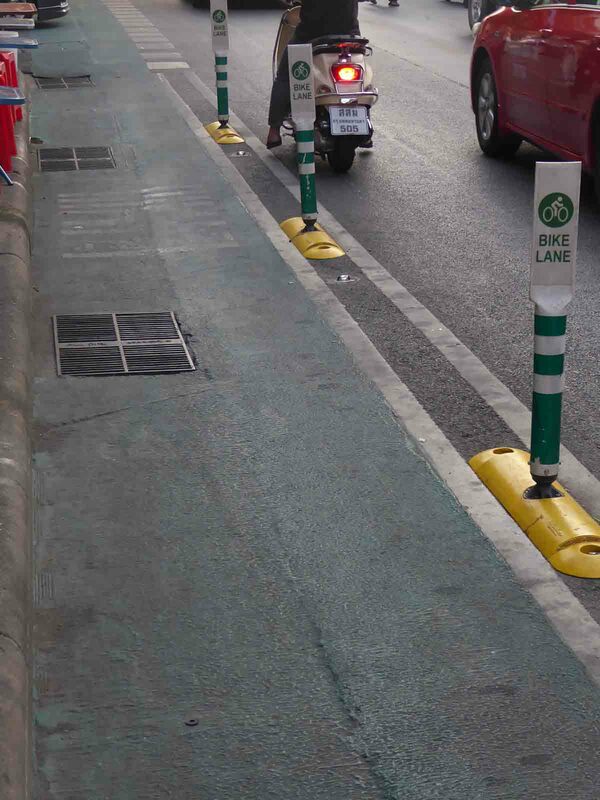 The cycle lane is green and flanked with plastic bollards that are closely spaced to keep out encroaching vehicles. The route starts and finishes at Ratchadamnoen Avenue and you go in a one-way direction. 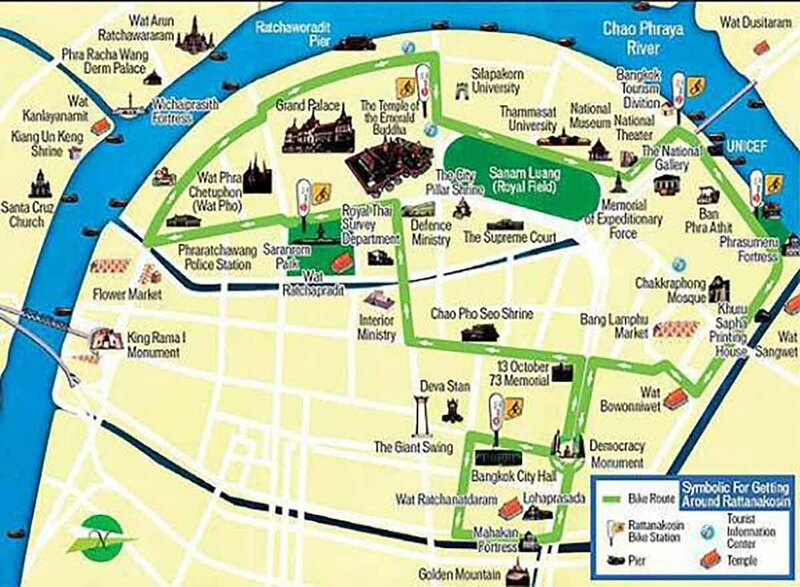 Route maps are available from the Bangkok tourist office on Phra Athit Road. If you’re interested in taking an organized, guided group bicycle tour there a whole host of options both day and night. The tours mainly keep away from busy roads and explore the lesser known areas of the city.